UMN Extension has some important training opportunities coming up for those home bakers, confectioners, fermenters, jammers, etc who sell their goods at our great MN farmers' markets (and elsewhere) - so, it's a good time to share this particular set of info. If you haven't heard of the cottage food law, or have questions about what you need to do in order to sell your homemade goods, check out the info below. This article from the Start Tribune provides some background, context, and basic information on the Cottage Food Law. Click below to read. This MN Department of Ag (MDA) website explains the rule and it's requirements. If you're a cottage food producer, you may be required to take an advance training as explained on the MDA's website (see above). Workshops are quickly approaching! 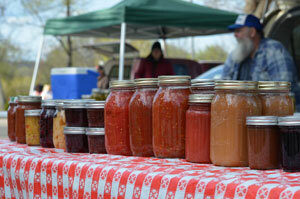 Do you make and sell baked goods, home-canned pickles, salsa, jam and jellies? Are your annual sales $5001-$18,000 per year? If yes, this workshop is for you. By attending this session, you will meet the training requirement to register as a cottage food producer with the Minnesota Department of Agriculture. It's possible that you have questions about all this Cottage food law business that have already been answered, UMN Extension and MDA have "Frequently Asked Questions" sections on their websites. Are there rules on sanitizing my bottles to package kombucha? I don't want to use bleach. Could I use vinegar? Someone told me I couldn’t sell home-canned spaghetti sauce because it requires pressure canning. Is that true? Is honey or maple syrup a cottage food? Is there a cost to registration or a limit on the amount of food I can sell? Where can I sell food that I make? Can I have a Community Supported Agriculture model of distribution for products under the Cottage Food Producer Registration? That's it for this week, have a great weekend!